Read To Me I was walking along the boardwalk, or, more accurately, what passes for one on the West Coast. Nothing at all like Wildwood or Atlantic City or Coney Island….West Coast is all concrete and lacks for me the timelessness and nostalgia of the East Coast legacy. I was in Pacific Beach when I spotted a hand painted van, cerulean blue, enameled and festooned with acrylic glitter paint and bright, high key purples, blues and pinks. Written were bible passages, psalms and hymns. Little hearts and wings and variously collaged images hand painted in the style of an outsider folk artist. 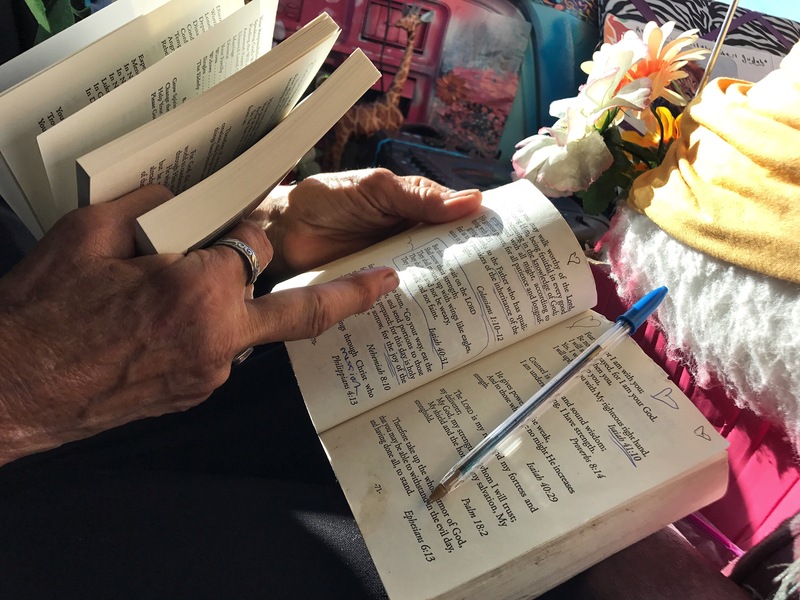 An older woman sat inside the van’s driver seat, happily singing improvised, hand made religious hymns. 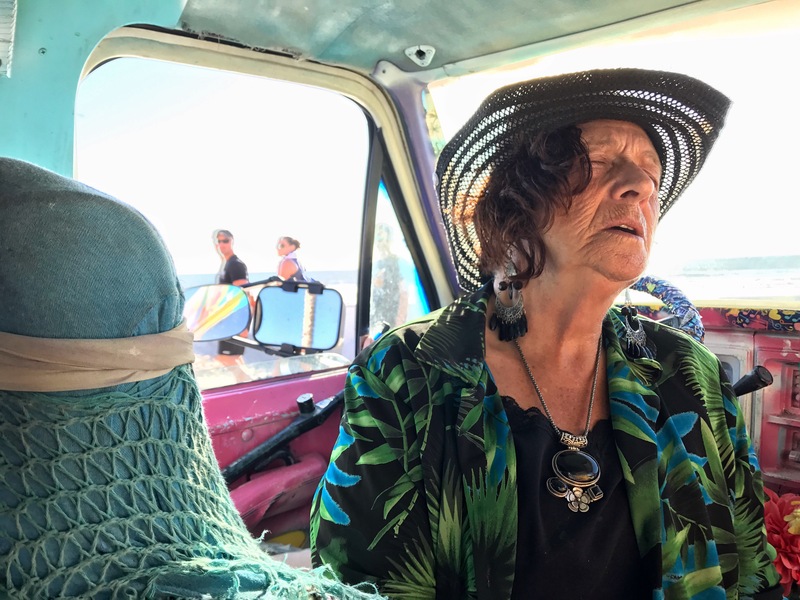 I asked her if I could photograph her van and she nodded and kept singing. I was reminded of the first few chapters of the Stephen King novel The Stand, one of my all time favorites. A character from the days following Captain Trips….The Dark Man and The Old Woman, the innocence of Tom Cullen along with the depth of regret that characterized Larry Underwood. Some serpentine twists and turns along the neural pathways that govern logic, perception and real time separate her from these characters, but everything else is strongly reminiscent. 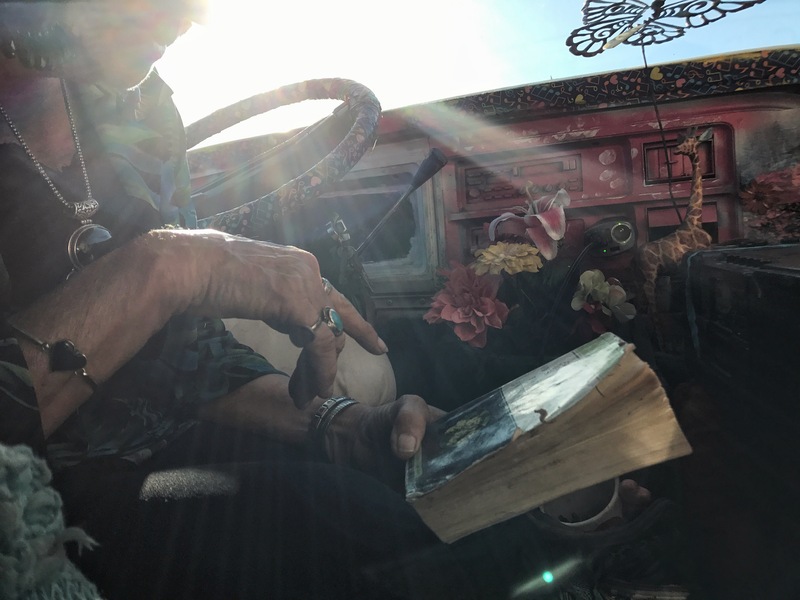 She invited me to sit inside her floral, potpourri scented van, decorated with odds and ends, scarves and silk flowers and acrylic painted fixtures, all in the same high key colors as on the outside of the van. The scent of potpourri brought me back to my high school days of potpourri burners, dried flowers and essential oils. I felt instantly comfortable, and she began in earnest to read me as clearly as if she were reading a newspaper. Factually, and correctly. In the most unusual of places I find myself being undressed in ways I hadn’t anticipated.